It’s been a good run, EpicMix, but it’s time for me to move on. It’s not you. Heck, it’s not even me. It’s someone else. Her name is Ski Tracks for iPhone. 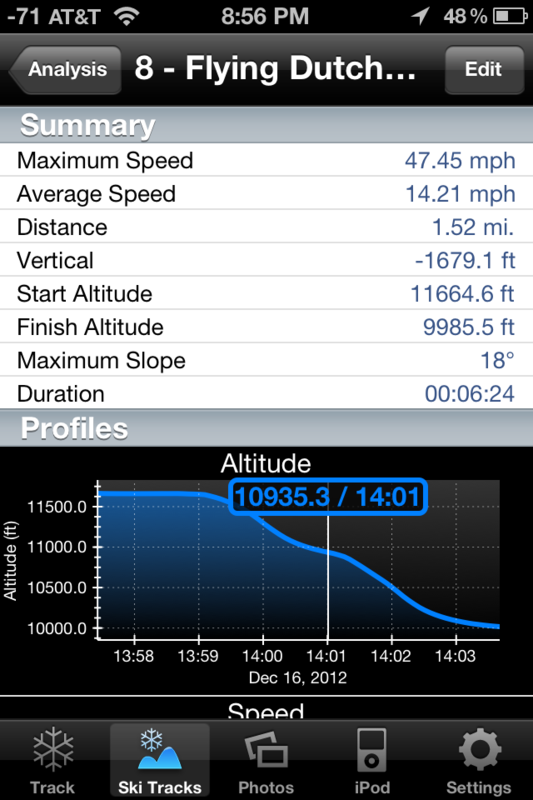 Ski Tracks is an iOS GPS tracking app, one of hundreds in the App Store. But this one gets (almost) everything right, including the price: $0.99. Simply put, it combines my love of skiing with my love of quantitative, nerdy, map stuff. Zen, I has it. • Battery Friendly with Battery Monitor – Records up to 14 hours. • Run by Run Ski Analysis. 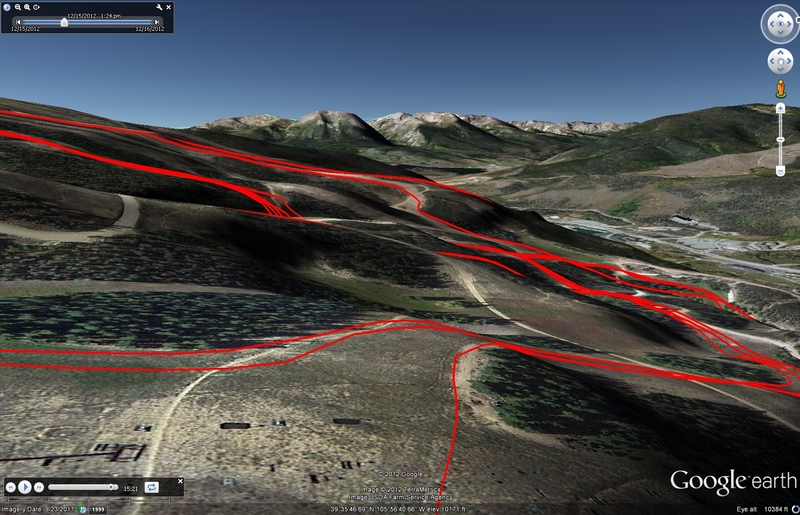 • Animated Preview in Maps and 3D Google Earth. • Maps with Standard and Satellite modes. • Share tracks in Facebook or Google Earth . • Metric and Imperial units. Specs! The three things that jumped out to me after reading the app description were the claim that it could constantly run GPS in the background for 14 hours, it could do run-by-run analysis, and it had the ability to export to Google Earth. Oh, and I forgot: ONE DOLLAR! I figured for that cost, the least I could do would be to run it until the battery dies, export the KMZ, reformat the KMZ to a geodatabase, and play around with the data in the GIS tool of my choice. After one weekend running the app, I’m amazed. Pretty impressive. Obviously this is all elevation driven, much like EpicMix before, but it’s all done via the phone’s GPS referencing your realtime location rather than via an RFID sensor at the lift referencing some data table of vertical footage for that particular machine. Whenever the app perceives a change from elevation climbing to leveling off or descending, it inserts a placemark in the track and starts a new run. Pretty genius, I must say, and something I wish I had thought of myself. With these placemarks, Ski Tracks can then have start times, end times, and locations for your run and can thus calculate your speed, slope, and tax bracket. And this is only the stuff that you can easily access on your iPhone. The real beauty of this app is the output options. KMZ, GPX, and screenshots to Facebook. The easiest option, the one 99% of the population will use, is to export photos of your ski tracks to a topo map and post these photos to Facebook. Really, I can’t complain about this option. It’s quick, it’s easy, and at least it looks better than a red bread-crumb trail on a blurry aerial image from Google. Of course, as a GIS geek this option is quite limiting to me. Let me have access to the data and I’ll make something absolutely beautiful and flawless, as 1s and 0s go. What’s this? You have KMZ, you say? Now we’re talking. I don’t know why Core Coders hid KMZ and GPX export in an email sharing dialog, but it’s the second best feature of this app, behind only how it distinguishes between the various runs you make. Here is my raw KMZ from last Saturday, in case you wanted to see it in action. Hello there, points in space! Oh yeah! 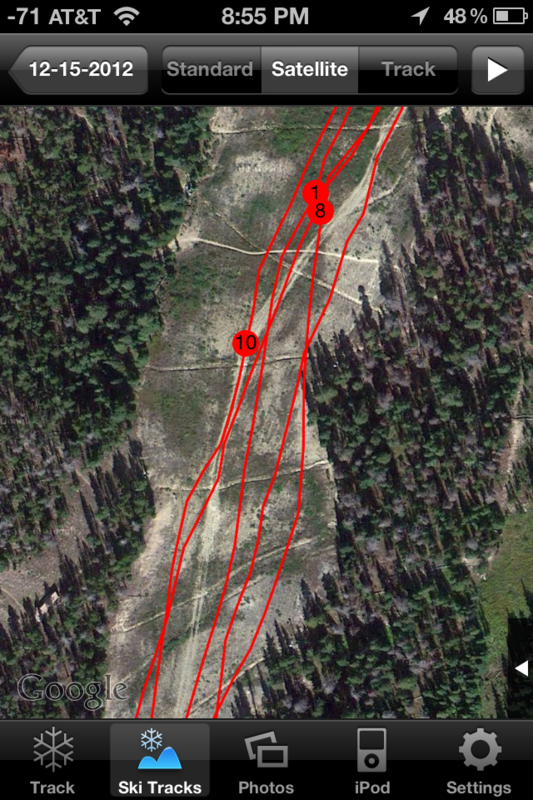 It’s that the tracks are just draped over a low resolution DEM, rather than using the elevation data from the GPS. When I run KMZ-to-geodatabase tools so I can play with the data, the output claims to be a Polyline-Z format, but it’s most definitely not. In the ArcScene image above, the KMZ output is the flat red line at the bottom and the GPX output is the series of floating points. Obviously the elevation data comes from the GPS rather than a DEM, so why have two separate methods of showing elevation for your output formats? Further, why is the day’s track only shown as one long bread-crumb? 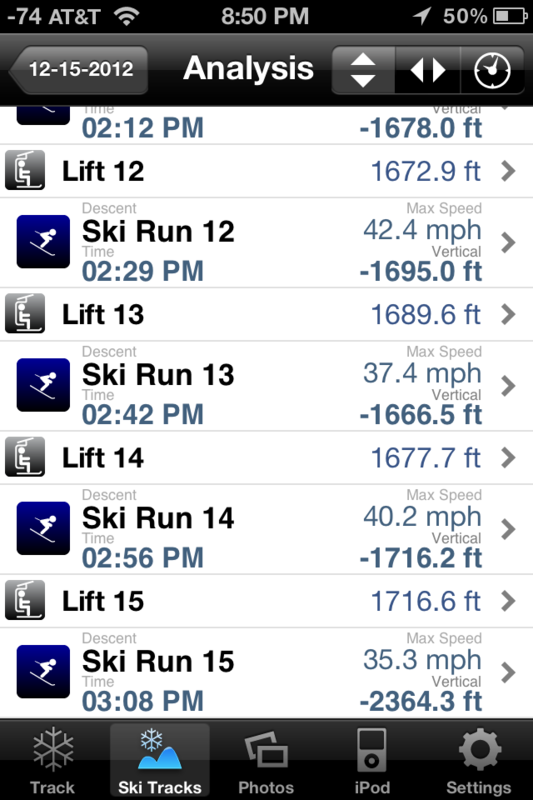 As we saw earlier, the app can distinguish between various runs and lifts throughout the day. Use those placemarks to color code the runs and lifts of the day. Maybe even add the stats as an attribute table so you click on a run to see the speed, slope, time, distance, etc.. You don’t even have to pay me for that quick suggestion, Core Coders, but please include it in your next update. Perhaps I’m being too harsh on the KMZ export. Its primary purpose is to shock and awe those who don’t work with this kind of stuff for a living. In that, it succeeds. Heck, even at first glance, I’m impressed. It’s a nice, quick way to share your experience. For geogeeks, the GPX export is worth the price of admission, alone. After looking at the attributes, I’m impressed that an app that refreshes GPS data every second while the unit is moving can keep a battery charge for so long. I mean, look at the timestamp data in the above image. 1-2 seconds per data refresh, and it still lasts for an entire day of skiing. But also note the data that is included in GPX: X, Y, Z, time, track name, and ski area description (automatically populated with the ski area’s name via the GPS coordinates, another nice touch). 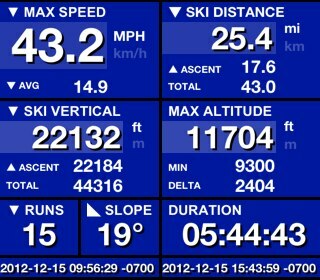 Of note is what’s missing: run number, speed, and slope calculations, AKA the juiciest data! All three figures can be calculated with the data available, but it’s frustrating to add this step to a workflow when the app already did it in near realtime way back when the user was recording a track. (Coincidentally, if anyone has a script for computing speed and slope programmatically, please let me know. Major brain fart here.) As it stands, I’m just going to piggyback off of GPS Visualizer’s conversion tool, though I don’t trust the slope calculation presented there, and manually input Run IDs based upon elevation peaks and low values over a set timespan of 20 minutes or so. Again, Core Coders, please consider adding Run IDs in the GPX exports, perhaps using something as simple as appending the run number to the end of the Name field (for instance, in my GPX, the name would be more like 12-15-2012_Run_01 after the append). You already have the run and lift placemarks squirreled away in the app. Share the magic. 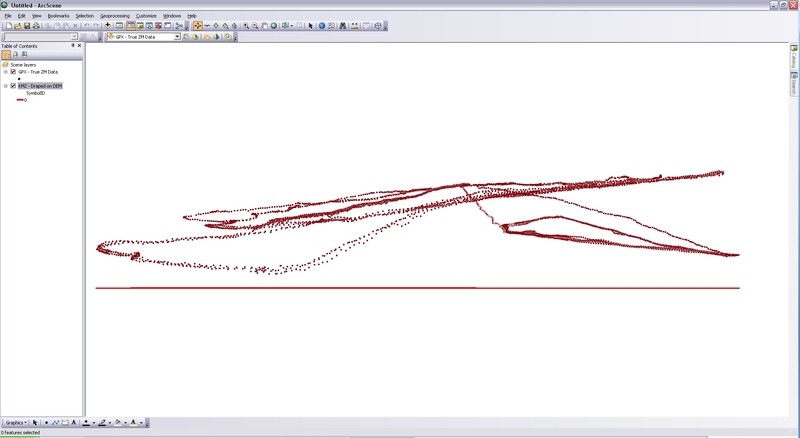 This would, in turn, make speed and slope calculation a lot easier for the end-user. One final suggestion that I would have for the app is to have it take into account the maximum slope and the average slope in order to rate the run against either some mountain-specific rating system or a universal standard and then color code the output KMZ line green, blue, or black accordingly. If it’s mountain specific, it’s the same idea as the current run color coding system. If you base it upon a universal grading, things get a bit more interesting in rating the varying difficulties of different ski areas, but maybe that’s something that’s long overdue. Anyway, that’s completely unnecessary in the grand scheme of things, but it would be an interesting way to improve the quick KMZ export and view. If you don’t do it, I will. 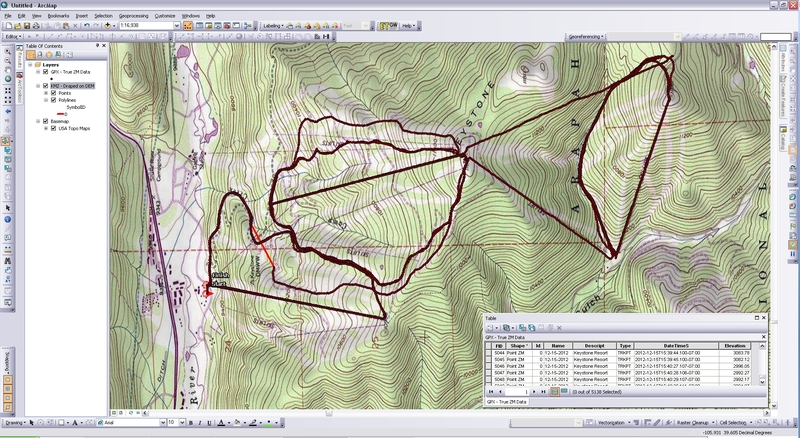 Though, I have to be honest, I’ll probably create a polygon file per ski area and spatially join the GPX points to respective runs on the trail map in order to grab the color code. Look, I can be lazy, too! What started with EpicMix has been expanded by Ski Tracks. I have new ways to annoy my Facebook friends by oversharing way more ski tracking data and visualizations than before. I am always hesitant to spend money on apps, but I haven’t regretted this purchase. It’s a slick package that provides plenty of eye candy for the novice, while the output options open a realm of possibilities to keep a geogeek like myself occupied for a long time. I’m already thinking of how I want to play with all of my future ski data. 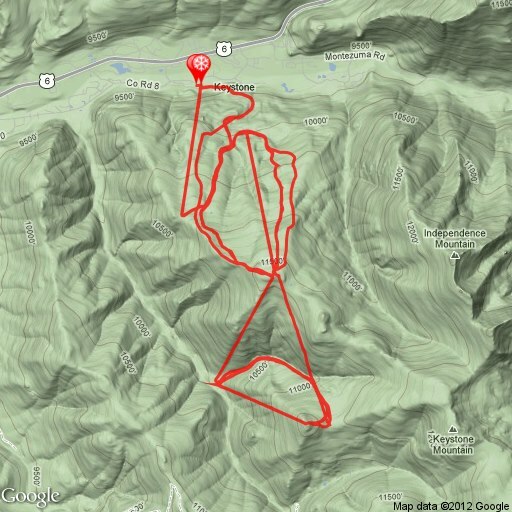 This is an app that makes me want to ski more; it reignites my passion for playing around with geospatial data. In short, it is the best dollar I have ever spent.